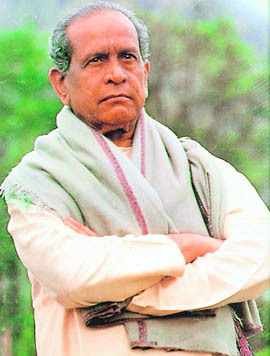 The demise of Bhimsen Joshi on January 24 in Pune marked the end of an era in Hindustani classical or, more accurately, Margiya music. He was 89. As a singer, he was a true star whose popularity cut across a wide variety of listeners, from the rasikas, or connoisseurs, to the uninitiated who were enthralled by his marvellous voice. I remember being thrilled by hid robust and miraculously honey dripped rendering of the raaga Kalashree on All India Radio(AIR) over 40 years ago. It took me some time to realise it was a long playing record courtesy HMV(his master's voice), now Saregama, broadcast by the radio satation. It must not be forgatten that he had been an AIR Lucknow staff artiste in 1941-42, doing three 10-minute broadcasts every week as a bhajan singer. He then shared a room with the not-yet-famous shehnai maestro Ustad Bismillah Khan. It was not untill 1946 that the limelight shone on him. In 2008, he was awarded the Bharat Ratna, the highest civilian award in the country. It was a distinction that he was to share with Bismillah Khan, his former roommate, who was honoured six years later. He had served his gods and loyal listeners through music, and to music he belonged.